This weekend all of the delicious cherry blossoms have been blown away by our April showers. Cherry blossoms are treasured in Japan precisely because of their temporal nature. Rearranging your schedule to have a drinking party under lit-up trees is one of the true joys of the year. But what happens to those petals after they blow away? 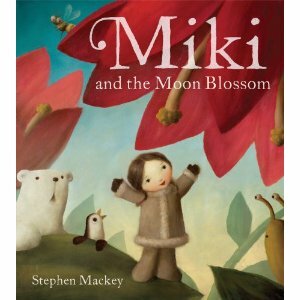 Miki and her arctic friends take a journey on one of these lovely blossoms, and it's a joy to go along for the ride! I really enjoyed Stephen Mackey's illustrations. Miki and her friends are really adorable, and the colour of the moon blossom, a deep red in a sea of arctic white, makes you think of hope and the end of a long cold winter. I won this book from the lovely Zara at The Bibliotaphe's Closet. We share a love for Canlit and Asian lit, but she is much more eloquent than I. Go check her out! What a novel idea for a book! Must read!